IntelliVIEW Comprehensive software suite Connecting for the Future The IntelliVIEW suite is a fully integrated software solution for the layout and design of a building's rough framing elements including roof and floor trusses, wall panels, solid sawn, EWP, construction hardware, sheathing and various ancillaries. 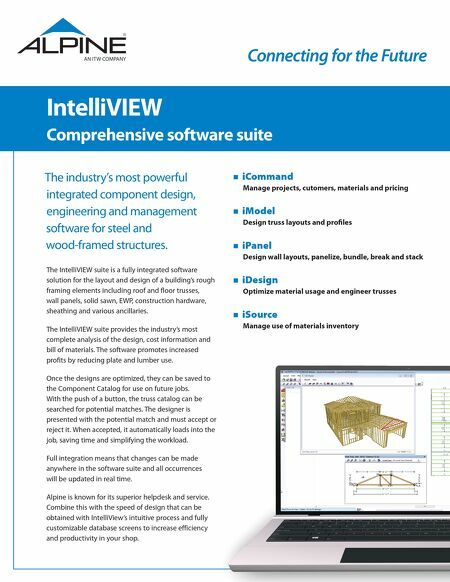 The IntelliVIEW suite provides the industry's most complete analysis of the design, cost information and bill of materials. The software promotes increased profits by reducing plate and lumber use. Once the designs are optimized, they can be saved to the Component Catalog for use on future jobs. With the push of a button, the truss catalog can be searched for potential matches. The designer is presented with the potential match and must accept or reject it. When accepted, it automatically loads into the job, saving time and simplifying the workload. Full integration means that changes can be made anywhere in the software suite and all occurrences will be updated in real time. Alpine is known for its superior helpdesk and service. Combine this with the speed of design that can be obtained with IntelliView's intuitive process and fully customizable database screens to increase efficiency and productivity in your shop. iCommand Manage and analyze data iModel Create truss layout and profiles for design iPanel Create wall layout and panel design iDesign Optimize component design iSource Manage use of materials inventory The industry's most powerful integrated component design and management software for steel and wood-framed structures.